Homam (also called havan) is a religious ritual performed by Hindus to invoke the blessings of specific Gods and Goddesses. It begins with the Karta (devotee) invoking Agni (God of fire) and inviting him to carry the dravya (offerings into the fire) to the concerned deity. The Gods, pleased with the offerings grant the wishes of the devotees in the form of benefits like longevity, success in business, good health, prosperity, progeny etc., Homams are poojas performed for a particular deity by invoking Agni , the God of fire, Please select any option from the list. Several different homams appropriate to obtain the desired benefits. Select the homam you prefer, and will arrange for it to be conducted according to prescribed formats on the date you specify. 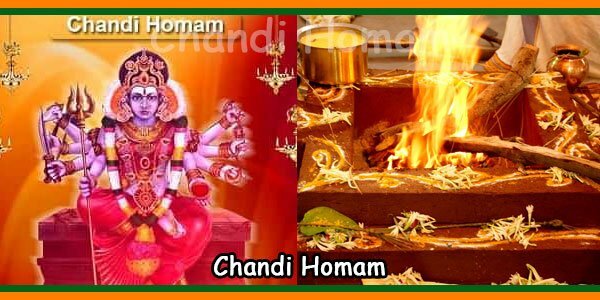 A Chandi Homam is a prominent Homam and one of the most powerful one for getting overall Success in all undertakings and also for removal of all kinds of Doshas and Obstacles in one’s life. This Homam also supports a person in getting victory over Enemies and in Court Cases. 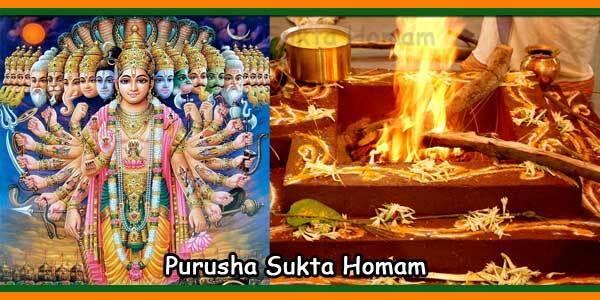 In this Homam, an extensive Puja and Homam are carried out for Devi Durga. In this Homam, Goddess Durga is worshipped as a 2-10 year old Kanya (Girl) and hence girls from the same age group are worshipped during this puja and homam. All the other incarnations of Devi Durga are also worshipped during the Chandi Puja and Homam. Everyone of us face troubles at one or the other time in our life. At times, we are able to deal with them by utilizing our Intellect, Hard work and Dedication. But sometimes, in spite of our best and maximum efforts, we are not able to solve our problems which may be negatively affecting our entire life and at times, even the lives of all those who are most near and dear to us. At such times, we should approach for help of Divine Intervention so that we can lead a Happier, Healthier and Wealthier life full of peace. A Chandi Homam is an ultimate prayer to Maa Durga (also known as Maa Chandi) which can be extraordinarily beneficial to us for removing all kinds of Obstacles and help us achieve our goal in life by clearing all our problems in life as per Ancient Vedic Texts. Hence, if you have a question in mind about “How to solve your problems in life”, then a Chandi Homa is an ultimate answer. What importance Rudrabhishekam holds for Lord Shiva, Chandi Homam holds for Devi Durga. Maa Durga in the form of Devi Chandi is the prime Deity of this Homam and her blessings are bound to clear all your obstacles and hurdles in your path to Success and Glory. Maa Chandi is a very strong and fierce deity. She is the primordial power that is responsible for the creation, maintenance and destruction of the entire universe. She amounts to all the energies of all beings of this Universe in sense of totality. Performance of a Maha Chandi Homam sets a person free from all kind of Black Magic, Evil Eyes, Obstacles, Negative Energies, Evil deeds against him and he is blessed with a long lasting Health, Wealth and Prosperity. Almost all the Spiritual Worship’s main feature is the worship of Goddess Chandi (Devi Durga) who is the ultimate Feminine Energy in this universe. She is the Mother of this Universe and she epitomizes in herself all the Divine Forces for saving her dear children on Earth from Evil forces (Asuras/ Demons). It is said that she is also a savior of even Devtas from the Asuri Shaktis (Demonic Forces). Well I get a chance of seeing and participating in the Chandi Homam that takes place every year in a temple near my house. 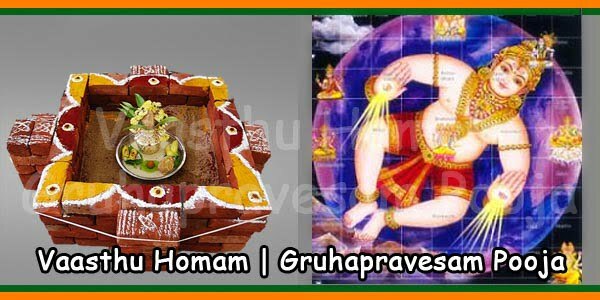 Before the completion of this Chandi Homam,the main preist who conducts this Homa tells about the benefits of conducting Chandi Homam and hence these are its benefits…. 1) Chandi Homam is used to invoke the Trimurthy goddessess-Lakshmi, Parvathi and Saraswati and their combined form Chandika. 2) Chandi Homam is a Homam used to invoke positive feelings by eliminating the negative energy around us. 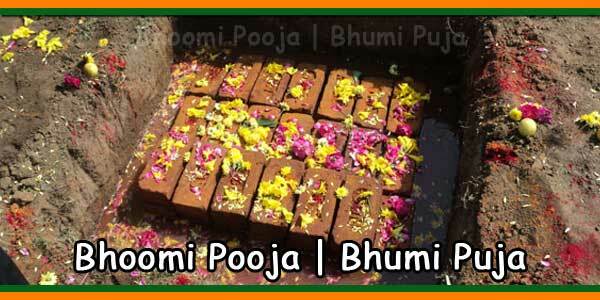 3) Chandi Homam is one of the Maha Homams that consists of chanting up of 7000 sacred slokas. 4) Its not so easy to conduct this Homa so easily because the Mangalya dravya (holy products) needed to conduct this Homa is not easily available. 5) One has to spend lakhs of money to conduct this Homa. So many people conduct this Homa together.The priests should have taken training under the Shringeri Mutt or with Kanchi Mutt( They spell the mantras very properly). 6) Actual length of this Homa is for 9 days but nowadays this Homa is shortened for either 1 or a max of 3 days. 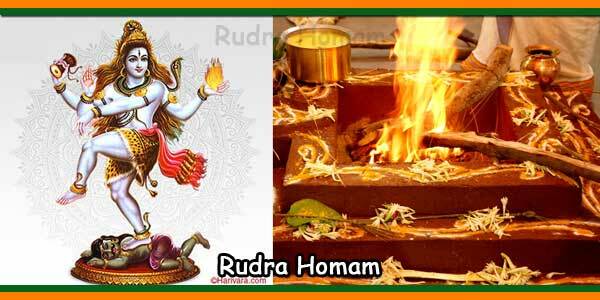 1) Performing Chandi Homam helps in overcoming obstacles and barriers in life. 2) Helps you attain success and win over one’s enemies. 3) Blesses one’s life with positivity and happiness. 4) Liberates one from evil eyes and curses. Note:-If you get a chance of participating in this Chandika Homa, please don’t miss it as it a powerful Homam that can make you feel better from all the problems. Ganapathy pooja: Prayers are offered to the Lord Ganesha seeking his blessings. Worshipping Lord Ganesha clears all the obstacles and paves way for one’s success. So, before any auspicious beginning, Lord Ganesha is first addressed with pooja and prayers. 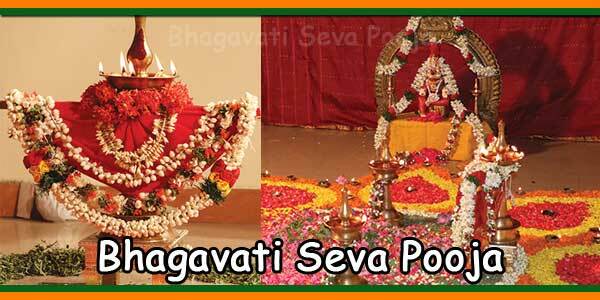 Kanya pooja: Kanya Pooja is one of the highlight of the Navaratri celebrations. Kanya pooja is a ritual of worshiping girls (aged 6 – 10) who haven’t attained puberty, symbolizing the Kanya Kumari (prepubescent) form of Goddess Chandi or Durga. This ritual is specially performed to recognize the divine feminine power vested in a girl child. Anugna Sankalpam: Seeking the consent of the Goddess to perform the Yagna which is a sacred ritual. The ritual specifies for whom, where and when the yagna is performed. Punyahavachanam: Purifying the mind, body and place before the yagna is performed. Water is sprinkled with mango leaves around the place with the chanting of Mantras. Kalasa Sthaapana: Kalasa means a pot. It is made of metal and is filled with water and placed with Mango leaves immersed in the water. Pooja is made to this Kalasa invoking the blessings of the goddess. Saptashati Parayanam: Chanting of Durga Saptashati Slokas (700 sanskrit poems) and worshipping the various forms of the Goddess. Bhairava Bhali (offering): After the chanting of Slokas, offering is made to Lord Bhairava (an incarnation of Lord Shiva) to signify the ritual. Gho pooja: The Sanskrit word Gho means Cow. In Hinduism, Cow is considered to be a holy animal embodied with divine qualities. Pooja and prayers are offered to the cow before the yagna, seeking her blessings for prosperity. Suhasini Pooja: Worshipping an elderly married woman (whose husband is alive) and performing Pada (traditional foot washing ceremony) pooja to invoke her blessings. Dampathi pooja: Dampathi means couple. Prayers are offered to an elderly couple with Padha pooja. Brahmachari pooja: A Brahmachari is an unmarried man. He is held in high esteem in Vedas and Puranas for several reasons. Padha pooja and prayers are offered to a Brahmachari seeking his blessings. Chandi yagna: The fire ritual is performed with the chanting of Mantras and Slokas. 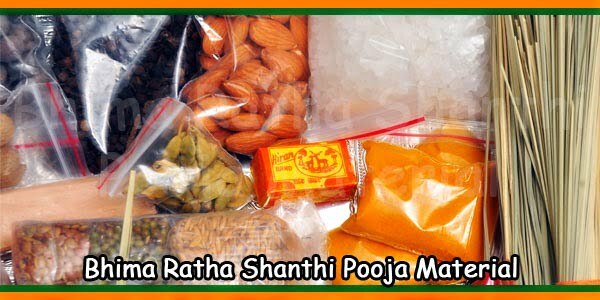 Sumangala Dravyaahuti: Auspicious materials such as Saree, turmeric, sandalwood powder, kumkum (vermillion) etc. are offered to the Goddess invoked in the Fire. 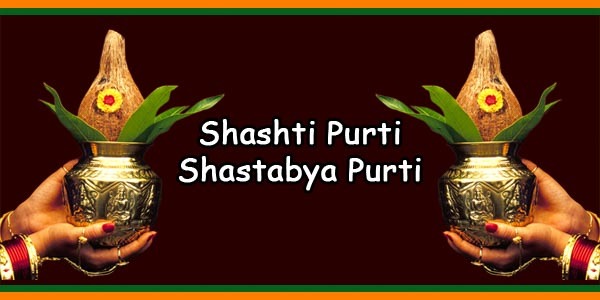 Purnaahuti: Any Yagna becomes complete only when this ritual is performed. Betel leaves, Betel nuts, Coconut, Kumkum (red colored auspicious powder), Turmeric, Flowers, Fruits, a coin, a small bag of herbs are put together in a silk cloth and tied. The bag is dropped into the fire seeking the blessings of the Almighty. Maha Deeparadhana: A ritual to honor the Goddess. Lights are lit using camphor and are used to glorify the Goddess. It is also called Aarthi and is performed during the end of the pooja. What is the cost of Chandi Homam? Since Chandi Homam is an extremely elaborate procedure, the cost of the Homam can range from ₹15,000 to ₹30,000 in some temples.